Veterans with PTSD often struggle to reconcile the horror of their combat experiences. Acceptance and commitment therapy teaches how to accept a void in purpose and still commit to change. From an existential viewpoint, this soldier was able to see his part in a larger universal scheme, a bigger picture. Vicktor Frankl, in his studies of Holocaust survivors, conceptualized logotherapy, which postulates that if individuals “cannot realize [their] ‘will to meaning’ in their lives, they will experience an abysmal sensation of meaninglessness and emptiness. The frustration of the existential need for meaningful goals will give rise to aggression, addiction, depression and suicidality, and it may engender or increase psychosomatic maladies and neurotic disorders” (Viktor Frankl Institut, n.d.). Unlike the soldier who wrote to his parents, what happens to the soldiers who remain traumatized by their experience and cannot find meaning in their sacrifice? Vietnam veterans often asked themselves “What was it for?” only to have self-doubt reinforced by the antiwar movement at home. Even popular songs of the day contained lyrics that were not only antiwar but also implied antiwarrior sentiment. In some lyrics, the soldier was blamed for the war and its emotional residuals. Speculation was that the high rates of PTSD among returning Vietnam veterans were, in part, due to the lack of a social safety net found in societal sanction of the war. Today, there are few if any popular songs that criticize the soldier for his participation in Operations Iraqi and Enduring Freedom (OIF/OEF). In contrast, patriotic songs exploded after the tragedy of 911, and soldiers were hailed as heroes in the global war on terrorism. The OIF/OEF veterans enjoy a more welcoming atmosphere on their return to the United States than their Vietnam counterparts did. It is unlikely they have been spat on or derided for their service like Vietnam vets often reported. Surprisingly, that level of societal support has not necessarily resulted in fewer readjustment difficulties among returnees. The incidence of PTSD and suicide remains high among returning soldiers (Kaplan, McFarland, Huguet, & Newsom, 2012; Kang, 2009). Concern for increased rates of suicide among OIF/OEF veterans even spurred the development of the Suicide Prevention program in the Department of Veterans Affairs. For some veterans, finding insufficient meaning in their experience results in the inability to make a successful emotional and vocational readjustment to society. According to a 2008 Center for Military Health Policy Research study, the prevalence of PTSD among returning OIF/OEF service members was 13.8%. The National Center for PTSD recommends three evidence-based approaches to treat returning soldiers: cognitive-processing therapy (CPT), prolonged exposure therapy (PE), and eye movement desensitization and reprocessing (EMDR). Mindfulness-based therapies, such as acceptance and commitment therapy (ACT), are considered adjunct therapies to these first-line treatments. Yet reportedly one-third to one-half of treated veterans show no improvement with CPT and PE. For those whose symptoms are embedded in a haunting sense of meaninglessness, ACT may be the treatment of choice. Although elements of ACT cross over with cognitive-behavioral therapy (CBT), ACT addresses the existential aspect of finding meaning in trauma and emphasizing values-consistent action. Even if no meaning can be found, ACT teaches how to accept a void in purpose and still commit to change. The mindfulness aspect of ACT involves nonjudgmental acceptance of the present moment, especially body or emotional sensations, coupled with nonconcern for the future. Behavior therapy is divided into three generations: traditional behaviorism, CBT, and the current “third generation” or contextual approaches to behavior (Hayes, 2009). ACT is considered as one of the third wave of behavioral therapies. This third wave of behaviorism has an existential bent in its premise that suffering is a basic characteristic of human life, a premise espoused by Frankl, and represents a dramatic change from traditional behaviorism and CBT due to the inclusion of acceptance and mindfulness-based interventions. The third wave, which also includes dialectical behavior therapy and mindfulness-based cognitive therapy, broadens attention to the psychological, contextual, and experiential world of its constituents. Since a significant percentage of treated veterans do not respond to the suggested first-line treatments of CPT, PE, or EMDR, perhaps ACT may be more than a suggested adjunct therapy. ACT represents a cognitive-behavioral approach coupled with a postmodern flair of externalization, contemplation, and acceptance. Acceptance is most important to veterans who often carry a debilitating sense of shame. Of course, a nonjudgmental relationship where the therapist accepts the veteran is crucial. But beyond the therapist’s acceptance, helping veterans get to a place where they accept themselves, their symptoms, and their conflict with the moral self and can still commit to go forward would be an ultimate goal. ACT is one approach that attempts to achieve that goal. Instead of trying to control experience, mindfulness aspects of ACT help clients learn “how to be with experience and accept it” (Siegel, 2011, 25). ACT suggests that a person can take action without first changing or eliminating feelings. Rather than fighting the feeling attached to a behavior, a person can observe himself or herself as having the feeling but still act. As one of the mindfulness-based approaches, ACT postulates that instead of opting for change alone, the most effective approach may be to accept and change (Dewane, 2008). The acceptance and mindfulness aspects of ACT can be summed up in two behaviors: observe and externalize. Developing “psychological flexibility” is a goal of ACT using techniques such as cognitive defusion, acceptance, contact with the present, self-observation, values, and committed action. A previous Social Work Today article described the techniques; however, only acceptance and self-observation are the focus of this discussion as it pertains to work with veterans (Dewane). Awareness and acceptance of symptoms may be a form of self-directed exposure therapy. Veterans are taught to experience their painful emotional states, their “private events,” without evaluation, judgment, or control. Instead of trying to avoid disturbing recollections or emotions, ACT prepares participants to coexist with them, observe them, and watch them in a detached way. If an evaluative thought is that there is no greater good for which someone has sacrificed a quality of emotional life, ACT would strive for acceptance—that there is no reassuring meaning, yet there are reasons for acceptance rather than avoidance. There are several instruments available to measure individuals’ ability to be aware of their current experience and be mindful. One core tenet of ACT is to be aware, accept, observe, and still change. The essence of acceptance is to observe and externalize. A veteran learns to observe and externalize, to go alongside and peacefully coexist with symptoms. A mantra for a veteran receiving ACT might be observe, externalize, act. Using the technique of externalization, he named the emotion of shame Shamu after the famous orca whale at SeaWorld. He continued the metaphor by saying he was living in the belly of the whale and couldn’t see out; Shamu had figuratively consumed him. With ACT work, the veteran began to notice (observe) when Shamu arrived and slowly began to envision swimming out of and with the whale. He switched from avoiding to accepting the shame (Shamu) as a sometime companion. “Riding the wave with Shamu” was a way of putting language to the experience of observing and externalizing. He was then able to continue to act according to what was important to him (values-consistent behavior): being a good parent to his children by giving them time and attention rather than depriving them of a parental relationship due to his shame-based withdrawal. There are many other ACT techniques, but the Shamu example demonstrates the externalization, acceptance, and act components of the model. Although there is limited evidence on the usefulness of integrating mindfulness-based therapies specifically when working with veterans, relevant literature suggests that it may serve an effective function in alleviating PTSD symptoms (Hamblen, Schnurr, Rosenberg, & Eftekhari, 2010). Twohig (2009) describes a case in which PTSD, not ameliorated by five months of CBT, was significantly improved after a similar length treatment with ACT. Blevins, Roca, and Spencer (2011) used ACT in a two-hour workshop, Life Guard, for returnees of the Arkansas National Guard. They used principles of ACT to promote skill development and resiliency for successful reintegration. Demonstrating that even a short round of ACT has a lasting effect, the workshop attendees experienced decreased symptoms and depression scores as well as increased satisfaction in relationships when compared with a control group. Additionally, there are randomized control trials currently being sponsored by the National Center for PTSD to evaluate the efficacy of ACT as more than an ancillary treatment for PTSD. CBT, PE, and EMDR are recognized empirically as the gold standard in PTSD treatment, yet a significant proportion of treated veterans show little improvement with these evidence-based treatments. An argument against evidence-based practice is that it is limiting. Just as certain medications are not as effective for some people as they are with others, certainly psychological therapies are equally ineffective. Some practitioners argue for practice-based evidence instead of evidence-based practice (Hellerstein, 2008; Smyth & Schorr, 2009). Social workers must look to expand their therapeutic repertoire to meet clients “where they are,” not force the treatment to fit the client. With that in mind, ACT is one important approach to consider when helping veterans to lead a more fulfilling life. “We pay too high a price when we give credence only to evidence that provides absolute assurance of change in a particular domain, for that threatens to skew our understanding of what constitutes a good intervention that changes lives, not one piece of a life” (Smyth & Schorr). Evidence-based practice may demonstrate accountability to funders, but social workers also must be accountable to their clients. Empiricism in social work is a relative to the medical model in which we are fixing symptoms but not necessarily healing people. In my clinical work with veterans, I have seen that many therapies can be effective, couched in the nonjudgmental holding environment of the therapeutic relationship. ACT may be just what the doctor ordered, even if the empirical literature has not yet caught up to its effectiveness with veterans. — Claudia J. Dewane, DEd, LCSW, is an associate professor of social work at Temple University. Her clinical work with veterans spans more than 30 years, and she worked for several years with Vietnam veterans and the Women Veterans Health Program as a clinical social worker and health systems specialist. Blevins, D., Roca, J. V., & Spencer, T. (2011). Life Guard: Evaluation of an ACT-based workshop to facilitate reintegration of OIF/OEF veterans. Professional Psychology: Research and Practice, 42(1), 32-39. Dewane, C. (2008). The ABCs of ACT — Acceptance and commitment therapy. 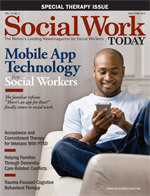 Social Work Today, 8(5), 34-37. Hamblen, J., Schnurr, P., Rosenberg, S., & Eftekhari, A. (2010). Enhancing PTSD treatment and delivery. Retrieved from http://www.ptsd.va.gov/professional/pages/enhancing-ptsd-treatment.asp. Hayes, S. (2009). Acceptance & commitment therapy (ACT). Retrieved from http://www.contextualpsychology.org/act. Hellerstein, D. J. (2008). Practice-based evidence rather than evidence-based practice in psychiatry. Medscape Journal of Medicine. Retrieved from http://www.medscape.com/viewarticle/575578. Kang, H. K., & Bullman, T. A. (2009). Is there an epidemic of suicides among current and former U.S. military personnel? Annals of Epidemiology, 19(10), 757–760. Kaplan, M.S., McFarland, B. H., Huguet, N., & Newsom, J. T. (2012). Estimating the risk of suicide among US veterans: How should we proceed from here? American Journal of Public Health, 102(S 1), S21-S23. Ludka, A. (2012). Fallen Marine’s last words: ‘It was all worth it.’ ABC News. Retrieved from http://abcnews.go.com/blogs/headlines/2012/02/fallen-marines-last-words-it-was-all-worth-it. Siegel, R. (2011). West meets east: Creating a new wisdom tradition. Psychotherapy Networker, 20-25. Smyth, K. F. & Schorr, L. B. (2009). A lot to lose: A call to rethink what constitutes “evidence” in finding social interventions that work. (Working Paper Series). Retrieved from http://www.hks.harvard.edu/ocpa/pdf/A%20Lot%20to%20Lose%20final.pdf. Twohig, M. P. (2009). Acceptance and commitment therapy for treatment-resistant posttraumatic stress disorder: A case study. Cognitive and Behavioral Practice, 16(3), 243-252. Viktor Frankl Institut. (n.d.). What is logotherapy and existential analysis? Retrieved from http://logotherapy.univie.ac.at/e/logotherapy.html.